Rembrandt van Rijn was a central figure in the Dutch Golden Age, a period of exceptional creativity, prosperity, military prowess and scientific discovery that took place in Holland during the 17th century. Born in 1606, Rembrandt was a prolific painter, draftsman and printmaker who made a mark in the visual arts that would endure throughout the centuries to come. Until his death in 1669, Rembrandt worked to develop his own Baroque style that was grounded in his classical education and informed by a unique understanding of the human condition. His works, ranging from portraits to scenes from the Bible, are each imbued with the exceptional stylistic prowess and emotional depth that makes them unmistakably Rembrandts. Rembrandt spent three years in van Swanengurgh's studio before moving to Amsterdam. There, he spent six months with painter Pieter Lastman, who specialized in religious art, and then moved on to study with Jacob Pynas, an artist who would later be labeled as a Pre-Rembrandtist. After a few months with Pynas, Rembrandt returned to Leiden where he established his own studio at the tender age of 18. His painter friend, Jan Lievens, was his partner in this venture. Within a couple of years, Rembrandt had taken on students, including future Golden Age painter Gerrit Dou. During this developmental period, Rembrandt completed a series of paintings depicting the five senses, which include "A Peddlar Selling Spectacles (Allegory of Sight)," "Three Singers (Allegory of Hearing)," "Unconscious Patient (Allegory of Smell)," "Stone Operation (Allegory of Touch)," and a painting that is now lost "(Allegory of Taste)." These are the earliest surviving works of the master, and they are all uniform in size. They are painted in oils on oak panels measuring 8.3 by 7.1 inches. Three figures appear in each work. Only one is signed with the initials RHF, or Rembrandt Harmenzoon fecit," which translates as, "Rembrandt, son of Harmen, made this." Interestingly, this particular painting was considered lost until it surfaced in New Jersey in 2015. Elements of his Leiden period paintings show the influence of his earlier teacher, Lastman and his studio mate, Lievens. The artist's style during these early years of his career was characterized by a smoothly textured technique, accurate portrayal of figures and richly wrought details, such as jewelry and clothing. In 1629, Rembrandt received his first major commissions, which came from state secretary Constantjin Huygens and the court of the Hague. These works caught the admiration of Prince Frederik Hendrik, who would purchase many additional Rembrandt paintings in future years. During his early career, Rembrandt also began producing etchings and is credited with elevating the craft into art. The first etching appearing around 1626, and the artist continued developing this type of work until he had to sell his printing press in 1660. As 1631 drew to a close, the artist moved to Amsterdam, a vibrant, rapidly growing city, where he began painting portraits. Among these income-producing commissions were "Bust of an Old Man With a Black Hat and Gorget" (1631), "Portrait of Princess Amalia van Solms" (1632), "Portrait of Mauritus Huygens" (1632), and "Portrait of a Young Woman with a Fan" (1633). He married Saskia van Uylenburgh in 1634, the daughter of a lawyer who had also been the mayor of Leeuwarden. Rembrandt and his bride subsequently had two infants who died soon after birth, a son in 1635 and a daughter in 1638. During the 1630s, Rembrandt painted scenes in large format from the Bible and from mythology with highly contrasting colors and dramatic flair. Critics see the influence of Rubens in such works as The Storm on the Sea of Galilee (1633), Belshazzars Feast (1635) and The Blinding of Samson (1636). Rembrandt solicited the help of his studio apprentices in keeping up with the brisk demand for portraits. Such paintings as the large-scale "Portrait of the Shipbuilder, Jan Rijcksen and His Wife" (1633) were among those he produced. Late in this decade, the artist focused on landscapes, both in oils and in etchings. In 1639, the couple moved into a new upscale residence that would later become the Rembrandt House Museum. After another loss of a newborn daughter the next year, Rembrandt's wife gave birth to a son, Titus, who would survive into adulthood. However, Saskia succumbed to what was probably tuberculosis in 1942, not long after Titus was born. The loss of his daughter and his wife no doubt contributed to a change in the artist's paintings during the 1640s, which became more somber in subject and tone. His work, The Night Watch (1642), a multi-figure military scene, numbers among his most important commissions of this time as well as one of the top paintings of the Dutch Golden Age. Enormous in size, measuring approximately 12 x 14 feet, the painting features dramatic contrasts of light and shadow. In the years following "The Night Watch," Rembrandt experimented with frontal lighting and composition, apparent in such works as "A Woman in Bed" (1643), "Girl at a Window" (1645) and A Woman Bathing (1654). During the 1640s, Rembrandt also explored brushwork as another mode of expression in his paintings. As the decade progressed, however, the artist devoted more of his time to etchings and landscapes. 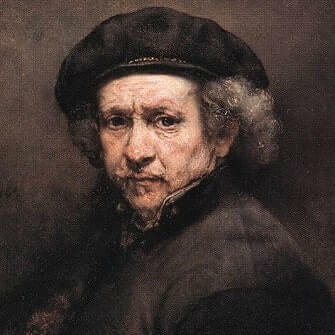 After a lengthy relationship with his infant son's caretaker, Geertje Dircx, which ultimately resulted in a breach of promise lawsuit against the artist, Rembrandt began a relationship with his former maid, Hendrickje Stoffels. They had a daughter together in 1654. In the 1650s, the master imbued his art with a richer, more colorful palette and textural brushwork elements. His style increasingly deviated from the existing standards of art, with some critics decrying the harshness of his brush strokes. Such works as "An Old Woman Reading" (1655) and "Hendrickje Stoffels" (c. 1654-59) illustrate the artist's mastery of the use of light. Rembrandt's continual purchases of fine art, prints and rarities, plus his expensive home mortgage, played significant roles in driving him to the brink of bankruptcy by 1656. He was forced to sell most of his acquisitions to avoid court action. Among the items he sold were the masterpieces of other artists, Asian antiquities and mineral collections. He also had to sell his home and his printing press. Another consequence of his financial troubles was being barred from selling his paintings by the Amsterdam Painters Guild, of which he had been a member since 1634. To get around this problem, his common-law wife, Hendrickje, and his son, Titus, established an art dealership in 1660, naming Rembrandt as an employee. This made it possible for him to sell his art. In the 1660s, the master continued to paint portraits and biblical scenes, combining the two themes in his series of Apostles portraits, which he produced in 1661. In this same year, Rembrandt received a commission to provide art to the new city hall, but the work he painted, The Conspiracy of Claudius Civilis, was deemed unacceptable and sent back. Rembrandt subsequently reduced the huge 6.5 by 12-foot painting to a quarter of its original size to make it more marketable. Hendrickje died in 1663, with Titus following in 1668. Rembrandt's death occurred within a year of his son's in October, 1669. The great master died a pauper and was interred in an unmarked grave within the Westerkerk, a Reformed Dutch Protestant church in Amsterdam. Per the custom of the era for the poor, Rembrandt's remains were removed for disposal after 20 years' time. Among his final works, completed just prior to his death in 1669, were several self-portraits. His final painting, "Simon with Jesus," was unfinished when the artist died and all but destroyed by later artists who attempted to complete it. Rembrandt's body of work served as a touchstone for scores of artists that followed, from the students in his studio to luminaries like Van Gogh, Degas, and Picasso. Even contemporary painters like Francis Bacon and Frank Auerbach claim Rembrandt's influence. In 2013, curators combined four of Rembrandt's works and six of Auerbach's paintings in Raw Truth, an exhibit in Amsterdam's Rijksmuseum. Known for his realism and his ability to convey emotion, Rembrandt stood out among his contemporaries for painting the ugly as well as the beautiful. In the many self-portraits he made throughout his life, the master didn't romanticize but painted himself with all his flaws as he saw them, creating an accurate pictorial biography that would outlast his life by many centuries. Rembrandt's influence is inextricable from the history and the future of fine art. Copyright © 2011-Present www.RembrandtPaintings.com. All Rights Reserved.